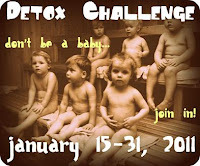 As I start my third week of detox, many of you are joining me for two weeks of your own detox experience. I'll be posting a full update tomorrow on how I'm doing so far. I've been alternately feeling euphoric and crappy oftentimes in the same day, but I'll go into more of that then!